FROG SONG is a magical, musical, melodic, tribute to frogs. "Frogs have a song for trees, bogs, burrows, and logs. When frogs have enough moisture to keep gooey eggs, squirmy tadpoles, and hoppity adults from drying out they can sing almost anywhere. CROAK! RIBBIT! BZZT! PLONK! BRACK! THRUM-RUM!" After that introduction, each two page spread focuses on a different and unusual frog from all over the world. "In Chile, the Darwin's frog sings in the beech forest. Chirp-Chweet! The male guards 30 eggs in the damp leaves for three weeks. When the tadpoles wiggle, he scoops them into his mouth. SLURP! They slither into his vocal sacs, where he keeps them safe and moist for seven weeks. Then he gives a big yawn and little froglets pop out. " I could see kids poring over this book with an atlas or globe right beside them. I'm not even sure where to begin to talk about Gennady Spirin's illustrations. They are so lifelike and detailed you almost feel like you are looking at photographs. I wonder if Spiring might do illustrations for scientific journals. And I'm not at all surprised to have seen this book on more than one Mock Caldecott list. Think it's definitely a contender. A two page spread in the back gives a photo, range, size, and a quick fact about each frog. Another page describes "Frogs in Trouble." 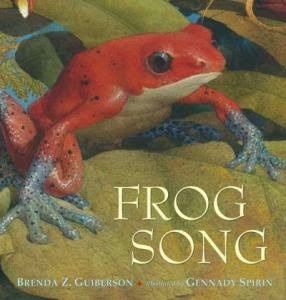 FROG SONG could be used in a unit on animals, or adaptation, or protecting the earth. It could be used in a nonfiction study of text structure. Or in writing for voice. Or it could simply be read and reread and enjoyed, because it's wonderful!